Bliss Hotel & Wellness may invite you to enjoy our hospitality again but this time it can be possible for FREE! 1. What I need to do to participate in this promotion? In order to participate you need to share your experience about your stay on booking.com. Your review is a valuable tool in our hand that leads us to the right direction and ensure the improvement of our services. – It is important that your review must appear on the booking.com website under your name. – Then please, send an email to [email protected] address about your participation request and write us your reservation number. The reservation number can be found in the confirmation which you have received from booking.com via email. 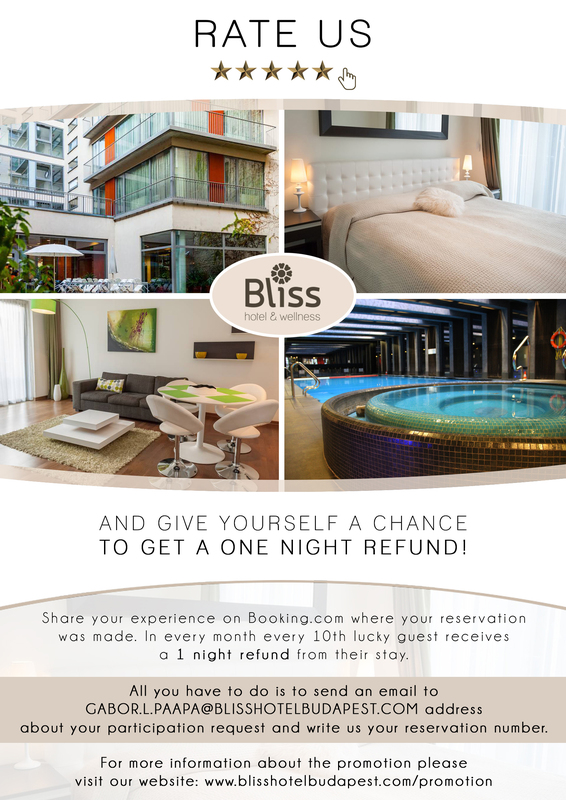 – In every month every 10th lucky guest will get a 1 night refund from there stay in Bliss Hotel & Wellness. Please, note that only the arrival date and time of your request email sent to us is the base of the calculation of the lucky guest. 2. What do I get If I get choosen? – Bliss Hotel & Wellness refunds a 1 night accommodation fee from your stay via bank transfer. 3. What is not included in the 1 night accommodation fee? The 1 night accommodation fee only includes the value paid for a 1 room night. City tax and services such as breakfast, dinner, room service, parking, etc. are not included. Should you have any queries please, do not hesitate to contact us.